At our custom shop we can make just about anything you can dream up. Different colors, cable lengths, end combinations and special cable. You name it and we will build it just for you. Some of our customers have asked for special cable like Belden Quad Star or Canare cable and many have ordered various special order lengths of speaker cables. We don't charge extra for special orders either so feel free to be creative. Also, feel free to use us as a sounding board (no pun intended) for ideas you have as well. If you have an application without a cable we can help you engineer a solution that will save you setup time and make you sound great! Like all of our other cables we use real Neutrik speakon ends (no fall apart clones) as well as Swithcraft and Dayton Audio Large bodied 1/4's. 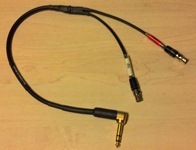 Our custom snakes use Neutrik ends and Gepco cable as well. Below are some of the custom cables we have made for our customers. Since pricing is based on the specific needs of the customer there are no prices listed here, just some ideas to get you started. 1/4 male jumbo to speakon adapter to plug into speakon cable mounted NL4 series plugs.